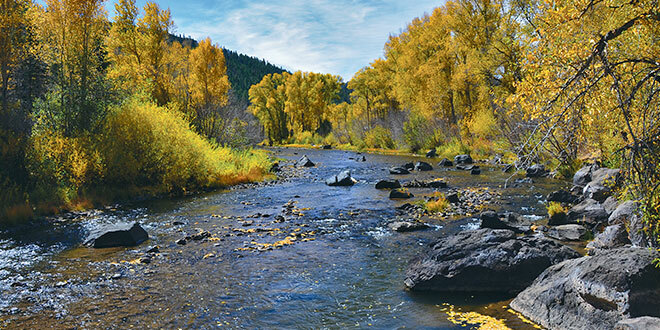 For years, the remote New Mexico Department of Game and Fish Rio de los Pinos Wildlife Management Area was best known among anglers for its solitude and scenery, not the fishing. That could change now that the department has completed an estimated $300,000 habitat improvement project on almost two miles of the river flowing through the property in north-central New Mexico. Above: The scenic Rio de los Pinos Wildlife Management Area, top, in northern New Mexico boasts impressive scenery in a quiet, remote location. NMDGF photo by Karl Moffatt. The department’s contractors, Riverbend Engineering of Albuquerque and Robins Construction of Antonito, Colo., designed and installed dozens of in-stream fish habitat structures and deepened many pools. They also narrowed the stream in some places, redirected it in others and planted plenty of native grasses, shrubs and willows to improve erosion control and provide future shade for the river. Above:Plunge pools, bottom, provide deep, well-oxygenated places where fish and can hide and thrive. NMDGF photo by Karl Moffatt. The Rio de los Pinos has long been a wild brown trout fishery but, because it lacked depth, structure and shade, it could not support a thriving population. “What we were seeing up there was less than half of what we’d like to see in a brown trout fishery,” said Shaun Green, a coldwater fisheries biologist with the department. Department personnel regularly stock the river with hatchery-raised rainbow trout between May and September to augment the angling, but biologists thought they could improve the fishing by improving the conditions. 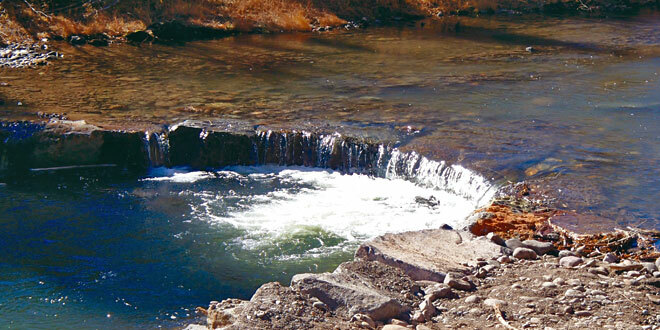 Visitors will now find deeper pools that provide better holding areas for trout. Construction crews created plunge pools that help oxygenate the water and provide more habitat for trout to reside, and big boulders and tree stumps were strategically installed to create additional habitat for fish. “It’s a beautiful spot and this is another example of angler license fees being put to good work,” Green said. Take U.S. 285 north through Tres Piedras toward Antonio, Colo. Take the San Antonio turnoff at Conejos County Road C. Follow to the intersection of Road 12.5. Turn left and follow along the river for about six miles to signs designating the department’s wildlife management area. Primitive camping is allowed year-round. Vault toilets are on site, but there is no water, electric or septic available. 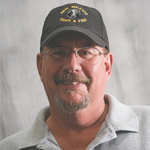 Karl Moffatt is a writer, photographer and spokesman for the New Mexico Department of Game and Fish. He can be reached at (505) 476-8007 or karl.moffatt@state.nm.us.